In the Control Panel, open the View menu and select Map View. 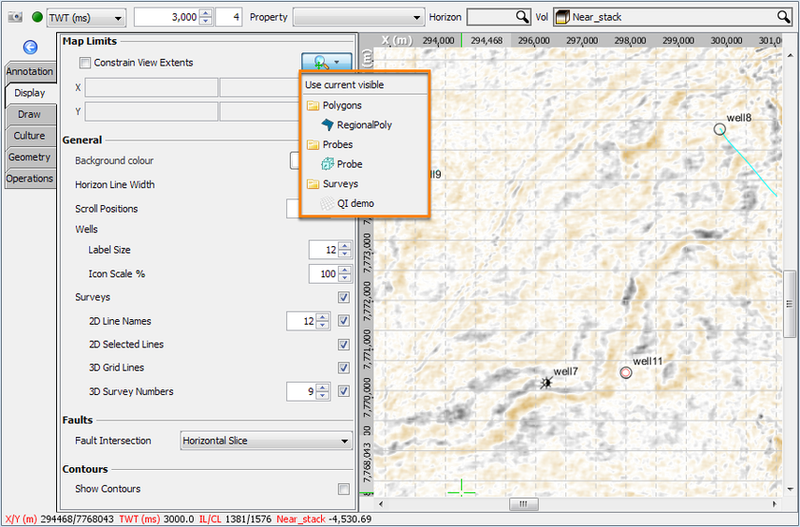 Multiple Map Views can be opened to display and compare the volume at different locations, or even to display different volumes or horizons (see Opening Multiple Views). Scroll the mouse wheel up to zoom in and down to zoom out. Hold down the right mouse button and drag a rectangle to zoom in to the area. Hold down the right mouse button and drag a selection along the X or Y axis to zoom in the selected axis range. Right-click in the Map View and click Zoom to fit to revert the view back to the full extents. Right-click on either axis to zoom-to-fit that one axis. Unlike most other views, the Map View has a fixed aspect ratio of 1:1. Therefore zooming one axis will also zoom the other. Note: In addition to these zoom controls, you also have the option to set the view to a specific scale (see Configuring Scale Parameters). holding down the left mouse button and drag to pan. In the Map View's Display tab, you can set a limit on the map size for this session. This is useful when you have an extremely large object (i.e. coastline, or other culture) that extends far beyond your project's area of interest. After setting this limit, all zoom actions, including Zoom to fit, will be constrained to this size. To remove the constrains, uncheck the Constrain View Extents check box. For more Map View display settings, see Customising the Map View.